A new study by AAA provides some firm data to back up what most electric vehicle owners know, and few electric vehicle manufacturers mention in their advertisements. EV range is dramatically reduced in cold temperatures. How much is it reduced? 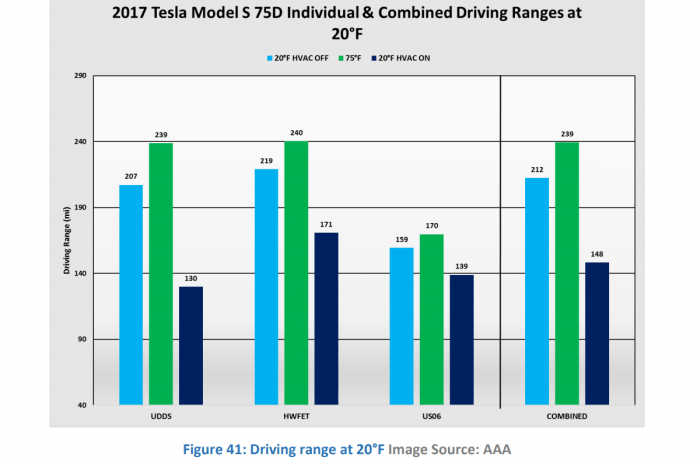 On average about 41% according to AAA who compared the driving range of five battery-electric vehicles (BEVs) at 20F to the driving range at 75F. The study includes affordable, premium, and luxury BEVs. Among the vehicles studied, the BMW i3 had the most reduction as a percentage of its range and the Nissan Leaf, the least reduction. The Tesla Model S, eGolf, and Bolt were in the middle area of range reduction. Every EV studied had a significant reduction. The AAA study looked at the range reduction in two ways. First, with no HVAC usage. We find it unrealistic that a vehicle owner would not use any of the car's heating systems, including seat heating or steering wheel heating in bitterly cold weather, but perhaps with preconditioning, this is a possibility. In any case, the average reduction in range with zero HVAC usage at 20F compared to 75F was a reduction of about 12%. When using the heating systems the drop is much more dramatic. The average for the five vehicles was 41%. That average takes into account a few different test cycles, which is why the top of page chart shows multiple comparisons for Model S 75D. The Model S lost just under 40% of its available range when its HVAC system was used in colder weather. If you have a Tesla, that is not really a huge problem if you are starting out with a full battery charge at home, particularly if your cabin and car are preconditioned (which uses external energy to warm the car and its components before you set out). However, if you have a BMW i3, your total winter range can be cut to just 55 miles, or a round-trip radius from a charger of fewer than 30 miles. As the second chart from AAA shows, warm weather, say 95F, also detracts from range. AAA is far from the first group to look at EV range in winter. However, it is one of the most respected. Other less formal studies have shown that EVs have a shorter range than advertised in winter and that they also can take up to twice as long to charge. Torque News found this to be particularly true recently when our test EV would only add back about 1.7 miles per hour on a 115 Volt charger. When we set the vehicle to precondition overnight we ended up with a net loss of displayed available range. You can view the AAA study in its entirety here. Yeah, anyone who has driven an EV in cold weather will tell you that the range takes a hit. Electrical heaters are not very efficient, and if I crank the heater when running off of the traction battery you can see the notable effect in reduced EV range. This actually is one point where PHEVs are better than BEVs. Gas engines naturally produce heat as a byproduct, so when I start my commute on a cold day I switch to Hold mode when I jump on the freeway (which turns on the gas generator engine) and I run it off gas for about 15 minutes which is enough to heat the car comfortably so that I can switch back to EV operation and make rest of the trip on electricity. It is the best of both worlds, with minimal gas and electricity use overall. Your comment would be a great foundation for a story. Thanks for posting it. Which vehicle are you referring to? I did this driving technique with my previous Volts, and now with our present cold weather I do it daily in my Cadillac ELR. Sweet! ELR is the hands-down best looking EV ever built. Possibly tied with Fisker Karma. Just my opinion. Yeah, I really like the ELR's styling, and also the Fisker Karma as well. Unfortunately, the ELR was overpriced which killed sales, and the Karma was designed more than it was engineered, which meant that it looked great, but fell short of all of Fisker's claims of superior performance and economy. The rebooted Karma Revero is trying to improve the car to be competitive, but today's competition has evolved and improved even further, from the current Tesla Model S, to the Jaguar iPace, to the upcoming Porsche Taycan, the EV alternatives are simply better in all respects.